Thanks to Deanna Jump at Mrs. Jump's Class for this week's great Let's Talk About Books Linky! It is one of my favorite linky parties to peruse... I always make new discoveries there. Hope my choice is new to you, too. Build It! 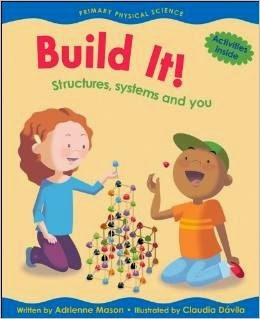 Structures, Systems and You by Adrienne Mason and Claudia Davila is a great book addition to any physical science construction unit in kindergarten. With clear definitions of what structures are, this book is oh so useful in expanding a young child's thinking around structures around only buildings. This book explores structures of all sorts, manmade and those found in nature. It also talks about materials and how parts are connected, and includes some really good suggestions for simple hands-on activities and experiments to demonstrate the concepts to kindergartners. My kidpeople love testing the strength of structures built different ways, and making a simple moving part bird puppet. The book itself is also a great example of the non-fiction genre, with clear illustrations and organization. I couldn't teach our construction unit without this book. There are quite a few other books in this series by Mason and Davila, and I'm betting they are equally as good. Check out your school and public library, or favorite book buying venue and you'll find them. While on the subject of construction, I have several science videos to round out this science unit that you can find on my Pinterest Science Video Board. Clicking on the cartoon me below will take you there. Do you know Build It!? Do you like it in other ways? Be sure to leave a comment and share. 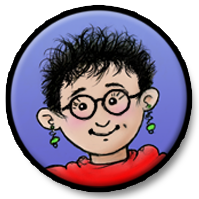 Now hop on over to Deanna's Linky by clicking below and you'll find all sorts of other great books... that's what I'm about to do! This book sounds great for my pulleys and ramps unit! I will definitely have to add it to my collection. Thank you so much for sharing! Yep, it will fit in nicely! Glad you can use it. Thanks for telling me! Funny Kid Friday- Answer Me! Five for Friday and a New Linky! Funny Kid Friday- New Linky Party! Workin' On A New Linky! MORE I Need My Monster! !